In a quiet shopping street situated completely renovated 2 bedroom apartment on the second floor of an old building. Please note there is no elevator, so if you're difficult to leg this apartment may not be suitable. Through its two bedrooms with King Size beds, it is perfect for couples, friends or a family with children. The modern kitchen, fully equipped, will allow you to cook any. The living room with wooden floor and giant flat and lounge chair allow you to even recover from all that Ghent has to offer. The luxury bathroom has a large shower and twin sinks. Summary: A modern, tasteful apartment, right in the center, yet quiet and additionally very affordable (especially for 4 people!). Are you for a longer period in Belgium? Then this is the ideal base to discover Flanders. The bathroom has a comfortable large walk-in shower and two sinks handy, with ample storage. The toilet is separate and thus separate from the bathroom. Your search for accommadation in Gent stops here. Four Girls on a week end celebrating 50th birthdays. Carine was prompt with replies and very helpful. After we booked, on request she sent us , what proved to be , excellent restaurant recommendations and alternative things to see and do in Gent. The apartment was perfectly placed. The number 1 tram from the station took us to the door. There were two pleasant, short walks to the main sights, either along the picturesque canal or through the lovely shops . Around the corner was a supermarket , places to pick up cakes and chocolates and the flower market at the week end. The apartment was spacious ,we were very comfortable and had plenty of room. We could dance about and flop and relax too! We also appreciated the fact that the toilet was separate from the bath room.The beds were great ; one room with twin beds and a second with a large double (with single duvets which was thoughtful). The property very clean, well decorated and in good working order. We would recommend this apartment to friends. This well-exceeded our expectations. Really appreciate the stay! It is always nice to read such a review. This is a truly wonderful location--a short walk to the castle and cathedral; plenty of shops nearby; and within a short distance of a carpark. The apartment itself had plenty of room, particularly in the large kitchen. The bathroom was also the largest one that we had during our trip to Europe, and it was very clean and modern. 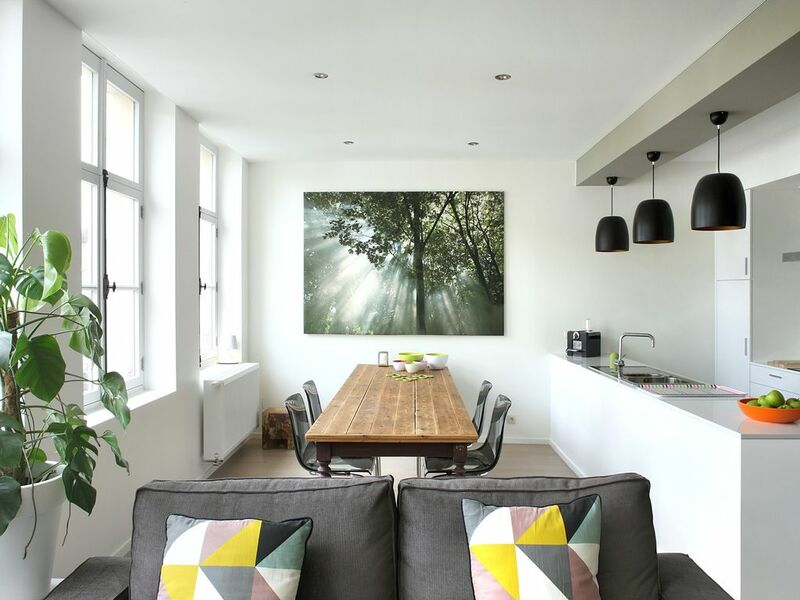 We would definitely recommend this apartment for anyone visiting Ghent. Thank you for the kind words. I am so happy you have enjoyed your stay. Perhaps we will see each other in the future in our Ghent. Lovely apartment. Really well equipped and comfortable. Excellent location too. The owners were very helpful with advice on where to eat and things to do. Would definitely recommend Gent and this apartment for a fantastic city break. It was a pleasure to have you as my guests. I am so happy that you liked the flat and enjoyed our beautiful city. Thank you so much for your kind words. It is always pleasant to hear people had a pleasant stay in For Four Flat ! Hope to see you again ! Kindest regards, Carine. calme, confortable et bien situé. Bon appartement pour visiter Gand. Aucun problème à signaler, si ce n'est que l'avertissement concernant les personnes à mobilité réduite ou défectueuse est exact : l'escalier d'accès est aussi raide qu'étroit.